Move your bass to the next level with DB Audio and their new DB Audio Xtinct 12 Subwoofer. It is such a red hot product even the basket is in a flaming red colour. 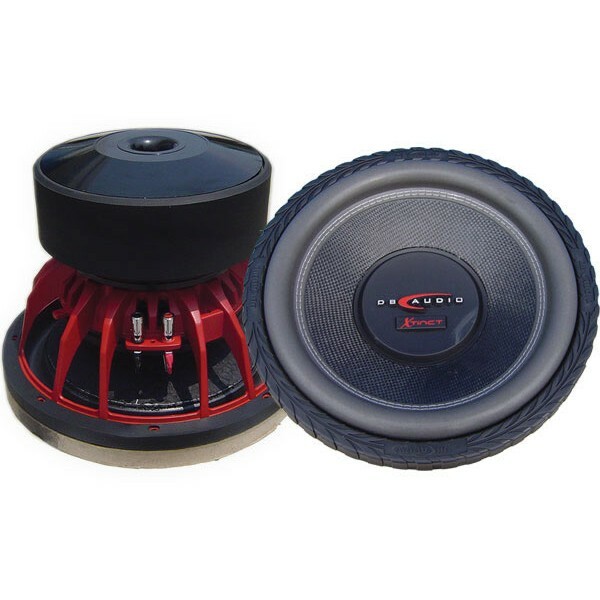 Get the power and control you require with a 3' hi-temp 4-layer voice coil and triple stacked 300 oz magnets. This DB Audio Xtinct 12 Subwoofer will rock your World and your car with it. With chrome push terminals and dual 2 ohm impedance nothing is going to stop you getting great sound from this Xtinct 12 subwoofer. I heard the 15" too this at Leicester car audio centre in there demo car, OMG it was loud. So i brought the 12" with a IPA4001D amp. The bass is unreal, It drops as low as 30hz in my car and you can hear it miles away. Really happy! Never thought you could this sort of bass for such little money. What is the best sub box for the Xtinct12 subwoofer? Please contact your local store as the Xtinct subwoofers needs custom box. The size Manual thingie for the 12 inch sub box has 2 options. That differ slightly in size. And then you’ve got the size for the 15 inch sub box. But I have the 12 inch one so which one 1 or 2. You can use the below amplifiers. before installing another subwoofer i would suggest that you have the amp tested, as this amplifier shouldn't blow 5 subwoofers, either the system isnt set up correctly, the user is turning the amplifier up far too much, the amplifier could be faulty and sending DC voltage into the subwoofers frying the coils, it could be a number of things, as subwoofers aren't covered under warranty, if you was to buy this subwoofer and blow it up because of a faulty amp you would be at a lost of �200, also what coils are the subwoofers you have been using? as that also matters. Do you have 2 xtinct 12s in stock? We do have the Xtinct 12s in stock.